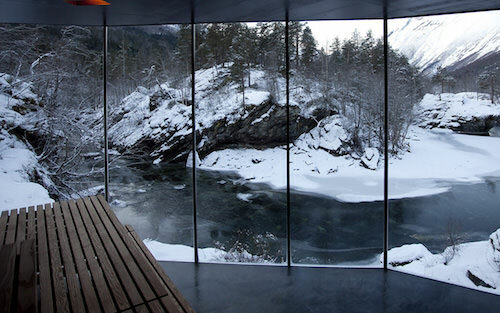 Juvet Landscape Hotel in Northwestern Norway is a synthesis of raw Norwegian nature, cultural history and modern architecture. 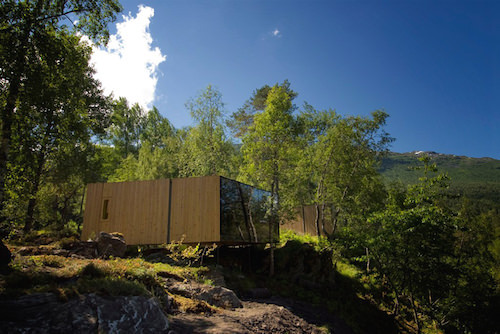 The first landscape hotel in Europe, Juvet Hotel is situated in the farmstead of Burtigarden farm at Alstad in Valldal, on a steep, natural levee amongst birch, aspen, pine and age-old boulders. In this little village in rural Norway, modern architecture encounters the natural and cultural landscape, and shows that the modern and innovative can go hand in hand with local building traditions and good, old-fashioned craftsmanship. The hotel consists of nine detached rooms that are sited separately, each with a unique perspective on the rugged landscape. In addition, there is the opportunity to stay in the old buildings on the farm – the mill house, the barn and the authentically restored farmhouse – while meals are served communally in the old barn. 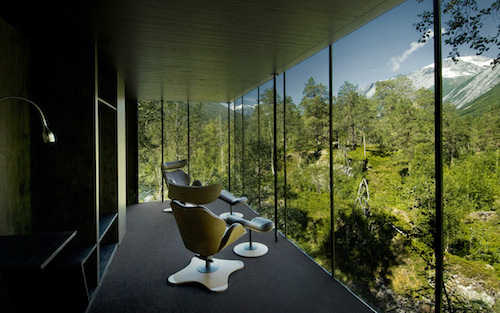 The architects Jensen & Skodvin envisioned a landscape hotel that would blend in with the natural environment. The result is seven small “cubes” on stilts, with glass walls that offer each space a striking view of the valley, the river, the courtyard or the dramatic gorge below. While no two rooms are alike, all the rooms have a dark interior to avoid stealing focus from the scenery. The stunning setting and architecture of Juvet Hotel attracted the directors of the 2015 movie Ex Machina which used it as their main location for the movie.